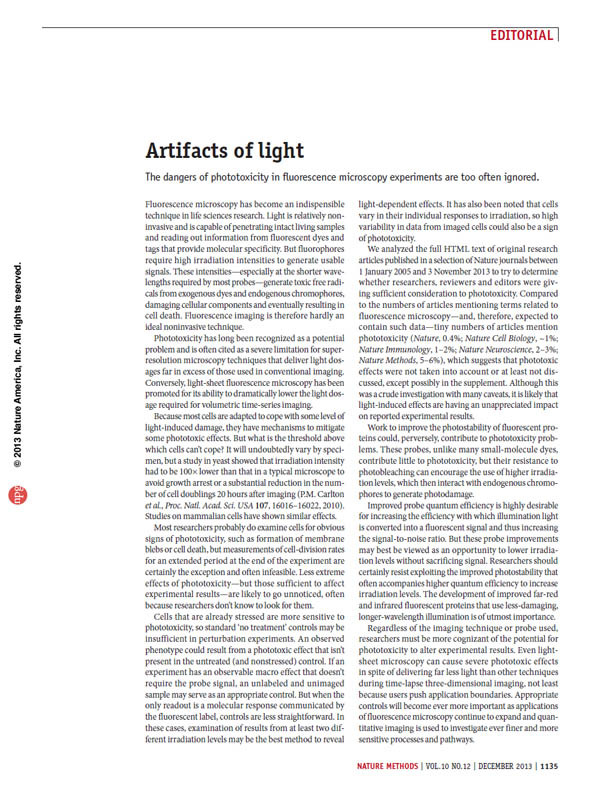 Light damages living cells. It is easy to obtain a clear, bright image of fixed, dead, cells labelled with exogenous fluorophores. It is much more challenging to keep cells healthy and alive for any length of time under the microscope at the correct pH and temperature, ensuring that heating does not disturb the plane of focus, and then reliably collect the weak endogenous fluorescent signal emitted by the specimen above the background noise generated collectively by both the specimen and the imaging system. It is possible to collect sufficient signal with long camera exposure times, but these decrease the signal-to-noise ratio, and permit bleaching and consequent photo-toxicity of the specimen. Very often the restraints imposed by imaging live cells will introduce spherical aberration (for more on the causes of spherical aberration and how to minimise it, see the webpage with Tips on collecting good images). 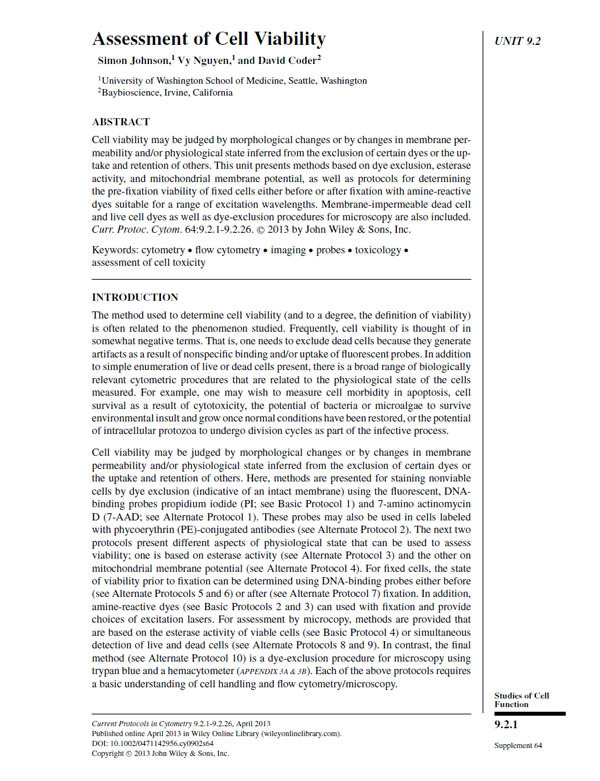 See also the live-cell and photo-toxicity references on the Useful microscopy papers webpage. 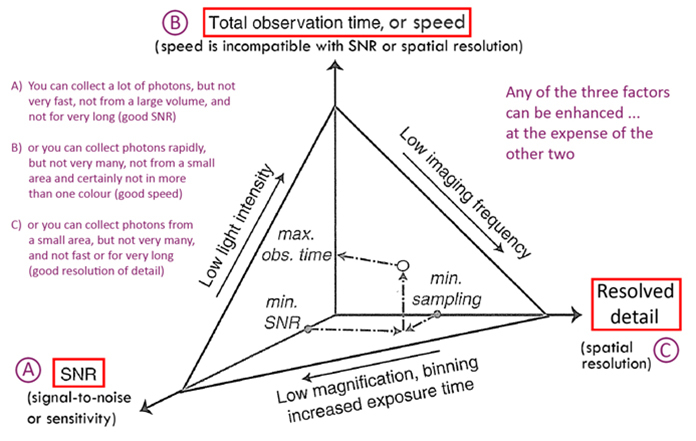 When imaging fixed cells you generally aim to maximize the signal-to-noise ratio (SNR) by either using longer exposure times in wide-field systems, or in the confocal microscope either by using a higher laser power or by increasing the time the laser dwells on each pixel (using slower scan speeds) and/or by averaging the overall signal (summing the signal from several frames). 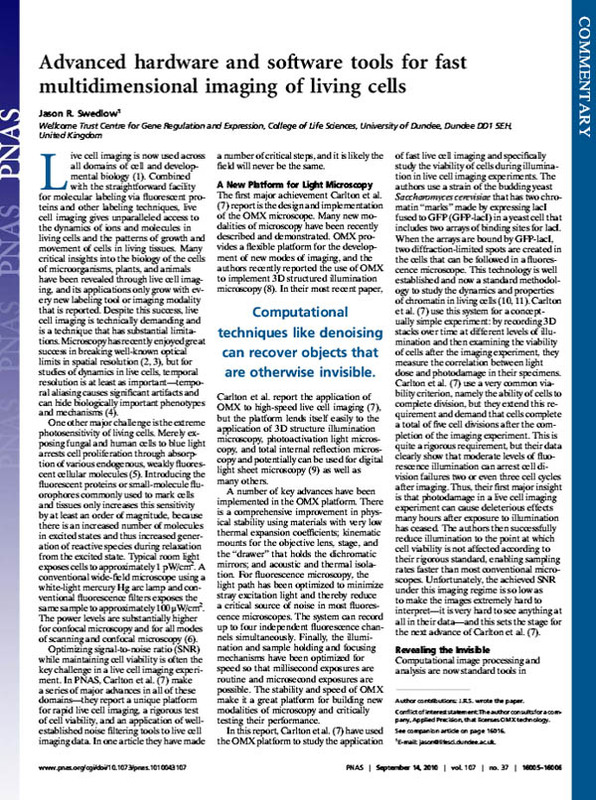 Collecting an adequate image of living cells – never mind a clear bright one – must often be sacrificed for detecting a signal that can usefully be correlated with healthy cellular function using the minimum illumination required to protect the living specimen against photo-damage and photo-bleaching. The choice of antifade reagents for live-cell imaging is limited, but people have had success with Oxyrase, ascorbic acid and Trolox (reference 9, below). When imaging live cells, budget & minimise your photons which cause damage. In the confocal microscope, reduce the exposure time, laser power intensity and pixel dwell time. Compensate by using a higher PMT gain, increased pinhole diameters, lower magnifications, In the widefield microscope, binning the signal, collecting a region of interest (ROI) or sub-array and using faster camera readout rates will also allow more rapid imaging. In both cases, consider under-sampling for Nyquist in the lateral x,y-axes and axial z-axis. The consequence of these all compromises will mean poorer resolution and reduced SNR. 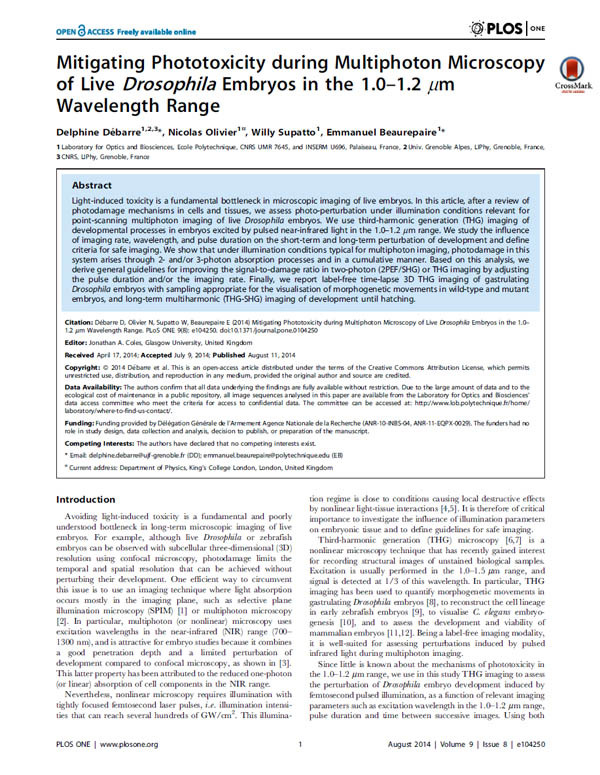 Any attempt to accurately colocalise and/or quantify the fluorescence signal from a living specimen is particularly difficult, and should not be underestimated, because these techniques require particularly high-quality images in the first place. Work out particular pH, CO2, humidity and temperature needs of your cells. Leave sufficient time to allow temperature hoods to equilibrate. Use phenol red-free and CO2-independent media to maintain pH, where possible. Minimise photo-bleaching – see checklist below – and use antifade reagents. Immobilise/anaesthetise samples where necessary to avoid undue movement. Take measures to avoid evaporation, which can affect exposure through the time-lapse. Measure gray scale values in image software to determine exposure. Monitor your cells after the experiment for healthy appearance and behaviour. Monitor cell health, especially when using high light flux and UV sources. UV light causes DNA damage and localised heating. Look for bulging (‘blebbing’) of plasma membranes, large vacuoles, enlarged and isolated mitochondria and clustering of fluorescent proteins. For more subtle changes, cell health can be monitored using live-cell stains. Use fluorescent stains at 1/10th the usual concentration, or less if you can – to reduce cell toxicity. (adapted from: Waters, JC  Live-Cell Fluorescence Imaging, chapter 7, pp. 115-140 in: Methods in Cell Biology vol. 81 Digital Microscopy (eds.) Sluder, G & Wolf, DE. ISBN-13 = 978-0123740250). Widefield microscopy is usually best for live-cell imaging. If the widefield fluorescence image looks good, and unblurred, through the eyepieces, you probably do not need a confocal microscope. For low-light level live-cell applications, it can be difficult to get an image with reasonable SNR at laser levels that do not bleach the specimen, and at speeds fast enough to capture cell dynamics and movement. Use a clean 170 mm coverslip (No. 1,5). Measure these before sterilisation and use. Mount specimen as close to distal side of coverslip as possible. Use high NA, minimally-corrected oil immersion clean objective with lowest acceptable magnification. Chose fluorescence filter sets that match fluorophores and minimise bleedthrough. Use inhibitors to retard photo-bleaching. Remove DIC Wollaston prism(s) and analyser from light path. Use cooled CCD camera with at least 6% quantum efficiency (QE). Use camera binning to increase signal intensity. Turn off room lights (light enters via microscope eyepieces). Perform good antibody staining with adequate blocking and controls. Do not use coloured nail varnish to seal specimen preparations. Use cooled CCD camera with low readout noise. For a comprehensive troubleshooting checklist for live-cell imaging see Table 19.2 in Experimental Considerations for Live-Cell Imaging from: Dailey, M.E et al. (2006) Confocal Microscopy of Living Cells, chapter 19, page 386 in: Handbook of Biological Confocal Microscopy 3rd edn. (ed. JB Pawley). 2. Shaw, SL (2006) Imaging the live plant cell. The Plant Journal 45: 573-598. 5. 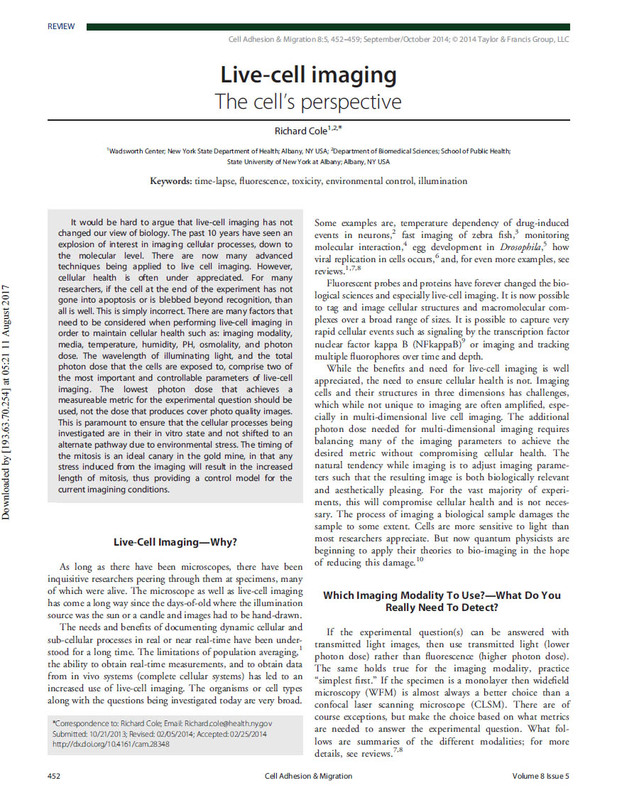 Hibbs, A (2004) Live-cell Imaging. Chapter 12 in: Confocal Microscopy for Biologists. 6. Dailey, ME et al. (2006) Confocal Microscopy of Living Cells, chapter 19, pp. 381-403 in: Handbook of Biological Confocal Microscopy 3rd edn. (ed. JB Pawley). 7. Khodjakov, A. and C.L. Rieder. 2006. Imaging the division process in living tissue culture cells. Methods 38:2-16. 8. 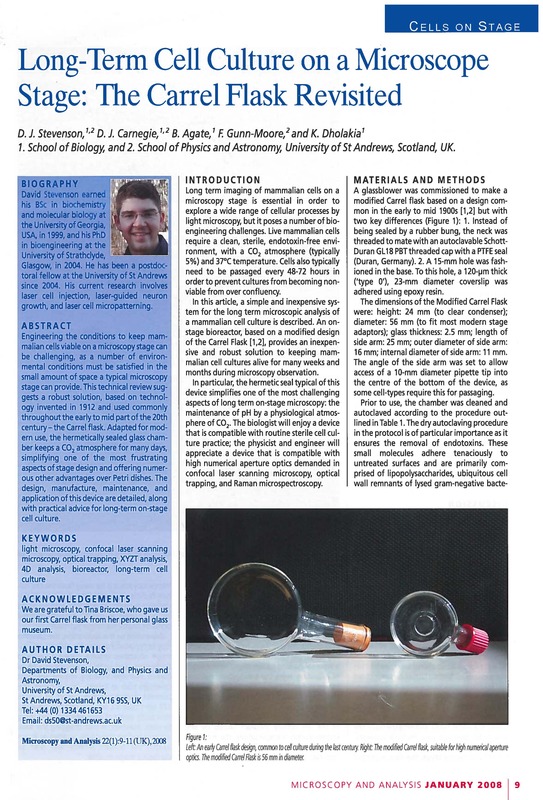 Kohlwein, SD (2000) The beauty of the yeast: live cell microscopy at the limits of optical resolution. Microsc Res Tech. 51(6):511-29. 9. Kamei M, Weinstein BM. (2005) Long-term time-lapse fluorescence imaging of developing zebrafish. Zebrafish. 2(2):113-23. 10. Dailey, M. E., Marrs, G. S., and Kurpius, D., (2005) Maintaining live cells and tissue slices in the imaging setup., in Imaging in Neuroscience and Development: A Laboratory Manual, Yuste, R. and Konnerth, A. (eds. ), Cold Spring Harbor Press, Cold Spring Harbor, New York, pages 1-8. Trolox: see: Swedlow & Andrews (2005) reference 3 above. See: Rasnik, I et al. (2006) Nature Methods 3 (11): 891-893.